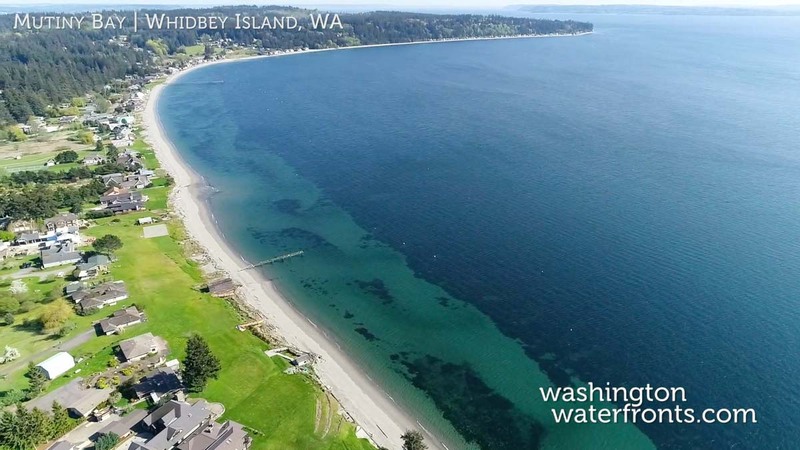 Mutiny Bay sits along the southwest shoreline of Whidbey Island, between Bush Point and Double Bluff offering the opportunity to own a home right along golden sands at the edge of pristine waters that are home to a wide range of wildlife. With Mutiny Bay waterfront real estate you’ll be within a few miles of the small town of Freeland, and less than a 20-minute drive from the Clinton ferry dock, for easy access to Seattle and the surrounding area via the Washington State Ferry too. Coming home from a long day at work, or wherever your travels take you, you’ll not only be surrounded by water, but multiple beaches, including Double Bluff and Sunlight beaches to the south, while South Whidbey Park is less than 5 miles away. With Mutiny Bay waterfront real estate, you can step right outside your door and enjoy majestic vistas of the Puget Sound and the Olympic Mountains beyond, take long strolls on the sandy beach, search for marine life at low tide and watch for the myriad of bird life, including blue herons, bald eagles and a variety of waterfowl. Sip a glass of wine overlooking the water while catching a glorious sunset, and then gaze up at the star-filled sky as the grand finale to your day. Of course, more active pursuits are at your fingertips, from kayaking, sailing and fishing to crabbing and more. South Whidbey Island State Park offers forested trails for hiking, while Holmes Harbor Golf Course offers the chance to tee off among gorgeous harbor views. The residential area around the bay includes everything from condos to new and well- established homes, in a variety of styles, all in a tranquil coastal environment that’s just a short drive from fine restaurants, an active arts scene, and all the urban amenities you could ever need. Take advantage of our industry-leading tools to make your property search as easy as possible and be sure to register for a FREE account so that you can receive email alerts whenever new Mutiny Bay real estate for sale hits the market. If you’re seeking to sell your Mutiny Bay property, contact our Waterfront Specialists directly for a comprehensive listing analysis and to learn more about the cutting-edge marketing strategies we’ll use to sell your home quickly for top dollar!